Math Tutoring Experts is a mathematics company that provides tutoring services for students in various mathematical courses. One of the main services provided is mathtutoringexperts.com. This online website provides tutoring students services in math courses such as Basic Math (Prealgebra), Algebra, Geometry, Trigonometry, Pre-Calculus, Calculus (Differential and Integral), and Statistics. The Math Tutoring Experts mission and purpose is to give exceptional services to students, parents, and organizations in regards to assisting students perform better on placement tests, retention, and overall grades. MTE also provides a monthly newsletter keeping its clients up-to-date on the latest information regarding the company and also helpful tips related to mathematics and how to implement successful steps when taking courses. Christopher Powell has a Bachelors of Science degree in mathematics from the University of Maryland at College Park. He also has vast experience in the educational field working with students with a leading community college. Chris’ objective has always been centered around student development in the area of math. Another core belief of Chris is helping students will apply to engage students in a path of self independence. Students are required to read their textbooks prior to appointment, attempt assigned homework, and come to each session with questions from their class. If these procedures are properly followed, then students will be well on their way to having success in their course material. 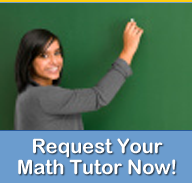 Let Math Tutoring Experts help prepare your student for ultimate math success!